For this thread I am going to concentrate on a number of groups and key figures which are at the forefront of globalisation, big business, media and the UN global enslavement, scientific dictatorship agenda. I haven't done a thread like this for a couple of years so bear with me as i go through my old notes etc, this will not be a fast moving thread but hopefully that will give the reader time to peruse the appropriate links and literature. I believe the Globalist Agenda takes many forms and has many autonomous but connected limbs, much of the intelligence network, spy networks and Eugenics science being transplanted from the Nazi 3rd Reich through the and into other countries after the destruction of Germany and the end of WWII, notably the US, USSR and South America. All of this was overseen by a multi-national, political/social Elite class with unlimited wealth and the ability to sway political leaders, monarchs and governors of any country, I will lay out in the following posts some of the institutions which are continually associated with this NWO agenda and then go into each one specifically and in more depth. The best resource for this kind of information on the web is undoubtedly here, I will be drawing very heavily from the ISGP website, and the sources provided on that site, so if you want to do the reading and study for yourself and not be spoon fed by me then go there, download the site and read it, if you take the extra time you will gain a far more developed and detailed explanation of covert Globalist politics than i can give you, and neat pictures to boot. I will be bolding names for easy identification so that the reader may check up on those individuals see where names are mentioned more than once etc. Might as well start with a bit more elaboration into Project/Operation Paperclip and the Ratlines to show this agenda is part of an ongoing process of which the 3rd Reich was only a "coming to the surface" or briefly visible manifestation of the great leviathan of evil lurking beneath the surface of mankinds awareness. Group of 104 German rocket scientists in 1946, including Wernher von Braun and Arthur Rudolph. The group had been subdivided into two sections: a smaller one at White Sands Proving Grounds for test launches and the larger at Fort Bliss for research. Many had worked to develop the V-2 Rocket at Peenemünde Germany and came to the U.S. after World War II, subsequently working on various rockets including the Explorer 1 Space rocket and the Saturn (rocket) at NASA. Convinced that German scientists could help America's postwar efforts, President Harry Truman agreed in September 1946 to authorize "Project Paperclip," a program to bring selected German scientists to work on America's behalf during the "Cold War" However, Truman expressly excluded anyone found "to have been a member of the Nazi party and more than a nominal participant in its activities, or an active supporter of Naziism or militarism." The War Department's Joint Intelligence Objectives Agency (JIOA) conducted background investigations of the scientists. When the JIOA formed to investigate the backgrounds and form dossiers on the Nazis, the Nazi Intelligence leader Reinhard Gehlen met with the CIA director Allen Dulles. Dulles and Gehlen hit it off immediately. Gehlen was a master spy for the Nazis and had infiltrated Russia with his vast Nazi Intelligence network. Dulles promised Gehlen that his Intelligence unit was safe in the CIA. Apparently, Wev decided to sidestep the problem. Dulles had the scientists dossier's re-written to eliminate incriminating evidence. As promised, Allen Dulles delivered the Nazi Intelligence unit to the CIA, which later opened many umbrella projects stemming from Nazi mad research. (MK-ULTRA / ARTICHOKE, OPERATION MIDNIGHT CLIMAX) Military Intelligence "cleansed" the files of Nazi references. By 1955, more than 760 German scientists had been granted citizenship in the U.S. and given prominent positions in the American scientific community. WERNHER VON BRAUN; From 1937 to 1945, von Braun was the technical director of the Peenemunde rocket research center, where the V-2 rocket --which devastated England--was developed. As noted previously, his dossier was rewritten so he didn't appear to have been an enthusiastic Nazi. Von Braun worked on guided missiles for the U.S. Army and was later director of NASA's Marshall Space Flight Center. He became a celebrity in the 1950s and early 1960s, as one of Walt Disney's experts on the World of Tomorrow. In 1970, he became NASA's associate administrator. KURT BLOME; A high-ranking Nazi scientist, Blome told U.S. military interrogators in 1945 that he had been ordered in 1943 to experiment with plague vaccines on concentration camp prisoners. He was tried at Nuremberg in 1947 on charges of practicing euthanasia (extermination of sick prisoners), and conducting experiments on humans. Although acquitted, his earlier admissions were well known, and it was generally accepted that he had indeed participated in the gruesome experiments. Two months after his Nuremberg acquittal, Blome was interviewed at Camp David, Maryland, about biological warfare. In 1951, he was hired by the U.S. Army Chemical Corps to work on chemical warfare. GENERAL REINHARD GEHLEN; It was five years after the end of WW2 but one of Hitler's chief intelligence officers was still on the job. From a walled-in compound in Bavaria, General Reinhard Gehlen oversaw a vast network of intelligence agents spying on Russia. His top aides were Nazi zealots who had committed some of the most notorious crimes of the war. Gehlen and his SS united were hired, and swiftly became agents of the CIA when they revealed their massive records on the Soviet Union to the US. Two of Gehlen's early recruits were Emil Augsburg and Dr. Franz Six, who had been part of mobile killing squads, which killed Jews, intellectuals, and Soviet partisans wherever they found them. Other early recruits included Willi Krichbaum, senior Gestapo leader for southeastern Europe, and the Gestapo chiefs of Paris and Kiel, Germany. With the encouragement of the CIA, Gehlen Org (Licio Gelli) set up rat lines to get Nazi war criminals out of Europe so they wouldn't be prosecuted. By setting up transit camps and issuing phony passports, the Gehlen Org helped more than 5,000 Nazis leave Europe and relocate around the world, especially in South and Central America. There, mass murderers like Klaus Barbie (the butcher of Lyons) helped governments set up death squads in Chile, Argentina, El Salvador, and elsewhere. KLAUS BARBIE; Known as the Nazi butcher of Lyons, France during World War 2, Barbie was part of the SS which was responsible for the and death of thousands of French people under the Germany occupation. Who is Gelli and why was he so important? To understand Gelli, one must understand the complex post war years of Europe. The biggest threat to Europe in pre-war times was Communism - it was the great fear of Communism that gave birth to the Fascists and the Nazis. Though both sides were dreaded, the Fascists represented right-wing government, while the Communist represent left-wing government. It was the right-wing that the United States and the Catholic Church desired over Communism - because Communism would destroy the capitalistic system. This is why the CIA and the Vatican had go through with Operation Paperclip. The Nazis had massive amounts of Soviet intelligence, had infilitrated Communist partisans, and were in no way going to be given up to the Soviet Union. Gelli worked both sides. He helped to found the Red Brigade, spied on Communist partisans and worked for the Nazis at the same time, a double agent. He helped establish the Rat Line, which assisted the flight of high ranking Nazi officials from Europe to South America, with passports supplied by the Vatican and with the full acknowledgment and blessing of the United States intelligence community. While on one hand, the U.S. participated in the war crime tribunals of key Nazi officials and maintained an alliance with the Communist Soviet Union, secretly, the U.S. was preparing for the cold war and needed the help of Nazis in the eventual struggle the U.S. would have with the Soviet Union. Gelli's agreement with U.S. Intelligence to spy on the Communists after the war was instrumental in saving his life. He was responsible for the murder and torture of hundreds of Yugoslavian partisans. The Vatican provided support to Nazis and Fascists because the Communists were the real threat to the Church's survival. The Italian Communists would have taxed the Church's vast holdings and the Church has had a dismal experience with Communist governments throughout the world - where religious freedom was stamped out. Recently a memo dated Oct. 21, 1946 from the Treasury Department has surfaced linking the Vatican directly with hiding Nazi gold. The memo quotes a reliable source in Italy as confirming that the Vatican was safeguarding approximately 200 million Swiss Francs for the Nazis. Presumably this gold was from the Nazi quislings, the Ustasha. What is for certain that the Vatican and US Government in conjunction with Gehlen Org, the OSS and new CIA, were fundamental and pivotal in ensuring the safe passage of Nazi operatives (of the worst kind) into places as far and wide as America, Middle East and the Orient ensuring the continuation of the work which had been underway in Germany 1939-1945. On to some of the modern day continuations of this power, globalist/fascist organisations, think tanks and advisory panels which have been around since before WWII and which have sprung up in the decades following it. Last edited by mo0n5tar; 17-02-2010 at 04:31 PM. I think I will start of with Le Cercle de Pinay. The foremost literature on this group has been compiled by David Teacher a translator at the European Union who back in 1988 and 1989 had published two major articles on a secretive group of French origin called the Pinay Cercle. These articles appeared in Lobster Magazine. "I had first learned about it in October 1967 when Carlo Pesenti, the owner of a number of important Italian corporations, took me aside at a Chase investment forum in Paris and invited me to join his group... The discussions were conducted in French, and usually I was the sole American present... Members of the Pesenti Group were all committed to European political and economic integration... My Chase associates, who feared my membership could be construed as "consorting with reactionaries," eventually prevailed upon me to withdraw." - 2002, David Rockefeller, 'Memoirs', p. 412-413.
clubs in the West... One member contacted by this newspaper said he could not talk about it "even off, off the record". Another simply put the phone down... The source of its funding is a mystery..."
Jean Violet has a murky past to say the least. In French and later English literature, Violet is named as a pre-WWII member of the Comite Secret pour l'Action Revolutionnaire (CSAR), a secretive fascist group which, like Freemasonry, had its own initiation rites (2). Some authors have suggested that CSAR, popularly known at the time as the Cagoule, or "hooded ones", was one of the most important branches of the legendary Synarchist Movement of Empire and worked to undermine the French Republic in preparation for the coming Nazi invasion (3). Violet soon managed to hook up with Opus Dei luminaries as Alfredo Sanchez Bella and Otto von Habsburg (6), who had founded the European Centre of Documentation and Information (CEDI) in 1949 (7). Habsburg was chairman for life of CEDI and later also of the Paneuropa Union. CEDI was one of the first in a long line of hard-right, often aristocratic institutions part of the Vatican-Paneuropa network. One of these institutions, founded by Antoine Pinay and Jean Violet, became Cercle Pinay, Violet was one of the few French members of this Cercle des Nations (13) that was part of the same Opusian Vatican-Paneuropa network. The crowd of Cercle des Nations has featured in a number of Belgian conspiracies and some were involved with the "Dutroux network"
Pinay and especially Violet were the official founders of Le Cercle, with Habsburg, vice president of the Paneuropa Union under Coudenhove-Kalergi, acting as Violet's patron. These men initially brought together Schuman, Monnet, Adenauer and a number of other individuals. All of these men, except Monnet, were either members or sympathizers of Opus Dei. The financial empire of Pesenti, who has no known direct ties to Opus Dei, was funded by the Vatican Bank and he turned out to be Banco Ambrosiano's largest minority shareholder when it collapsed in 1982. Monnet, as the only one among these names, was connected to leading bankers in London and New York, and used to be secretary general of the League of Nations. N.b. Pesenti might not have been a founding member, but used to be a top level player in the 1960s, chairing meetings and inviting David Rockefeller. He later also financed some of the work of Violet and Crozier. Carlo Pesenti~Scion of what was one of the wealthiest families of Italy until the 1970s, together with the Agnellis and Pirellis. Financier of some of the enterprises of Jean Violet and Brian Crozier; possibly also of Le Cercle. Chaired some of the meetings of Le Cercle and invited David Rockefeller. Julian Amery~Son of Leopold Amery (1873-1955), who was close associate of Lord Milner and the Rothschilds. Leopold was a British imperialist heavily involved in the creation of Israel. He also was a great supporter of Coudenhove-Kalergi's Paneuropa Union, which was initially funded by the Warburgs and Rothschilds. Reportedly a life-long MI6 operative, although it isn't really known what he has been doing in this function. In 1950, he became a Conservative member of parliament and served in the cabinets of Harold Macmillan and Edward Heath. Jonathan Aitken~reat nephew of Hitler-intimate Lord Beaverbrook, whose son ended up in the 1001 Club. Served as a war correspondent, and reportedly an MI6 agent, during the 1960s in the Middle-East, Vietnam, and Africa. Became a politician and member of parliament. During the 1980s, Aitken was a director of BMARC, a company that exported weapons to intermediary countries, who sold these weapons again to the intended countries (like Iraq). Lord Norman Lamont~Very influential British politician who was the campaign manager for John Major. Worked at Rothschilds from 1968 to 1979. Became an important politician and leading eurosceptic under Thatcher, who also led the Treaty of Maastricht negotiations for Britain. Handled Russia's negotiations with institutions as the IMF and World Bank on behalf of Gorbachev and Yeltsin. Appointed chairman of Le Cercle in 1996 after Aitken had to step down. Member of the Privy Council. Director of Scottish Re and many other insurance, banking, and chemical corporations. Advisor to the Monsanto Corporation. Chairman of the obscure Oil Club. Member of the Neoconservative Benador Associates, together with Arnaud de Borchgrave, Alexander Haig, and James Woolsey. Sought the release of Pinochet. Has visited Bilderberg. As chairman of the British Iranian Chamber of Commerce, he's been promoting increased trade with Iran while the US is about to attack this country for allegedly trying to create nuclear weapons. Perhaps more sinister, and certainly more shadowy than the Bilderbergers, the "Pinay Cercle" is an "Atlanticist" right-wing organisation of serving and retired intelligence operatives, military officers and politicians that conspired to "affect" changes in government. Amongst other things they claim credit for engineering the election of Margaret Thatcher in the U.K. and may have been behind the ousting of Australia’s Gough Whitlam. Last edited by mo0n5tar; 17-02-2010 at 05:25 PM. Some known US Cercle participants. Colby was Opus Dei; Casey and Feulner Knights of Malta. Brzezinski worked closely with the Knights in Americares, and like Kissinger, is close to the Rockefeller interests. 1976 Benjamin Nethanyahu went to work for the Boston Consulting Group. That July his older brother, Jonathan, was killed in a rescue of Israeli hostages at Entebbe, Uganda. He commemorated his brother by founding the Jonathan Institute, which sponsored international conferences on terrorism. It would be a mistake to imagine that George W. Bush declared war on terrorism on September 11. Rather he "re-declared" a war that Ronald Reagan had first created and financed, in the mid-1980s. While Jimmy Carter had used "human rights" as a focus for imposing U.S. hegemony, Ronald Reagan replaced that doctrine with his own war against "international terrorism." Within days of his inauguration, Secretary of State Alexander Haig announced that "international terrorism will take the place of human rights [as] our concern, because it is the ultimate ... abuse of human rights." This fundamental shift in policy was due in large part to the influence of a shadowy Israeli-American organization, the Jonathan Institute, founded in 1979 by Benjamin Netanyahu, the future Israeli prime minister, whose brother Jonathan was killed in the commando raid on Uganda's Entebbe airport in 1976. The Jonathan Institute became the emblematic think tank of Israeli and U.S. officials. The National Security state was giving way to the Counter-Terrorist state, with a catalogue of strategies that would come fully into the open when the September 11 attack made it possible for U.S. officials to speak without ambiguity. After the demise of the Soviet Union, the strategic equation changed only in its new definition of the Enemy. The acceptable policies of the Counter-Terrorist state were defined. A strong case can be made that the Jonathan Institute was established to insure not just the defeat of the Democrats in 1980, but the election of a Republican pledged to the international strategies of the Institute. The provocative underlying message promoted was: We must not wait to be attacked, but must institute "preemptive retaliation," a formula already expressed in early meetings of the Jonathan Institute. The precursor of the U.S.A. Patriot Act of 2002 can be found in Reagan's 1984 National Security Decision directive (NSDD) 138, authorizing paramilitary and military anti-terrorist squads as well as preemptive retaliation. Last edited by mo0n5tar; 17-02-2010 at 05:48 PM. Now if you want to follow up the links and do the study on Le Cercle thats fine, what I think my post illustrates is that politics makes strange bedfellows, in Le Cercle we see united under the flag of Right wing fascism; members of Opus Dei, Israeli Politicians, associates of Rothschild companies, Knights of Malta, CIA, MI5 and MI6 operatives etc etc. Georges Albertini~ Militant and leader of the Section Française de l'Internationale Ouvrière (SFIO) from 1933 to 1939, an important communist/socialist party, and part of Leon Blum's Popular Front. Just before the war, he became a fascist, ended up working for Pierre Laval, Marshal Petain's premier, was supposedly a top player in the secret and subversive Synarchist Movement of Empire, and one of the biggest nazi collaborators of the Vichy regime. Al-Faisal, Prince Turki~Also spelled as Turki bin Faisal. Born in 1945. Son of King Faisal, who was assassinated in 1975, and grandson of King Ibn Saud. His father King Faisal was a major force behind the Arab oil embargo against the United States in 1973. He is a nephew of the late King Fahd al-Saud, head of the House of Saud until his death in 2005. Faisal studied at Princeton, Cambridge, and Georgetown (Jesuit) Universities. Chairman King Faisal Center for Research and Islamic Studies. Co-Founder King Faisal Foundation. Supposedly promotes a peaceful version of Islam. Big fan of expensive cars. He is a visitor of DAVOS and headed the Saudi foreign intelligence services from 1977 to September 1, 2001, which is when he "asked" to be replaced. Bennett, Sir Erik~Born in 1928. Briefly served as an adviser to King Hussein of Jordan before moving to Oman in the early 1970s. In Oman he became an officer successfully helping Sultan Qaboos overthrow his father and fight Marxist rebels in Dhofar. Became a commander (Air Marshal) of Oman's Air Force in 1974, and still was in 1990 when Le Cercle held a meeting in Muscat in 1990. Alan Clark about the 1990 Le Cercle meeting: "I had a good meeting with Erik Bennett. He is a courtier of the very highest class." Giovanetti, Monsignor Alberto~Priest at the Vatican. Prominent member of Opus Dei and a virulent anti-communist, according to David Rockefeller in his 2002 memoirs. Defender of pope Pius XII, who has been accused of not standing up enough to Hitler during WWII. Last edited by mo0n5tar; 17-02-2010 at 06:08 PM. Let me start out by saying there's almost nothing known about this group. I stumbled across it at Bilderberg.org (1), where it was referred to as the Multinational Chairman's Committee. Didn't really pay attention to it at that time. Some months later, I found a group that was referred to as the Multinational Chairman's Group. Bond, Sir John ~Joined HSBC in 1961. He has spent 25 years working in Asia, in Hong Kong, Thailand, Singapore and Indonesia, and 5 years working in the USA. Executive director of HSBC from 1988 to 1992. CEO of HSBC from 1992 to 1998. Chairman since 1998. Director of Ford Motor Company. Former chairman of the Institute of International Finance (Washington). Former director of the London Stock Exchange, Orange plc, British Steel plc and the Court of the Bank of England. Broughton, Martin ~ Former chairman of British American Tobacco plc. Non-executive director of British Airways 2000-2004. Chairman of British Airways since 2004. Browne, Lord John ~The Lord Browne of Madingley is Group Chief Executive of British Petroleum (BP) p.l.c. Joined BP in 1966 as a university apprentice. Holds a degree in Physics from Cambridge University and an MS in Business from Stanford University, California. He is a non-executive director of the Intel Corporation, Goldman Sachs, and a trustee of The British Museum. FitzGerald, Sir Niall ~Joined board of Unilever in 1987. Chairman and CEO of Unilever from 1996 to 2004. Director of Reuters since 2003 and the new chairman since 2004. Multinational Chairman's Group - all is revealed? Ever heard of the Multinational Chairman's Group? I hadn't either. It does sound a little like the kind of shadowy yet powerful organisation which is believed by some to control the entire world, but from what I can make out it seems to be a lobbying group of big bosses who occasionally meet the Prime Minister to argue their corner. We may soon know more about it, as the Information Commissioner has instructed the Cabinet Office to reveal some background briefing material relating to the meetings. However Downing St won't have to disclose the speaking notes officials prepared for Tony Blair, partly because he might not actually have bothered to read out the points that his minions felt he ought to be making. The Commissioner's press release announcing the judgment, issued today, focuses somewhat surprisingly on the information to be withheld not to be released. It's the latest in a series of 'dog bites man' ICO press releases with a topline angled on the Commissioner backing public authorities when they have kept information secret. Anyone would think that the Commissioner is trying to get a reputation for protecting secrecy. the rokerfellers have there own little bunkers in there main homes that lead to underground facilities ready for w/e goes down in 2012 as im sure the vatican has there own custom bunker. funny when they told aaron russo "why do you care about those people just care about your own family" --that site was good though i have differences of opinion with em, they were being fed info from within but at the same time being led in a few directions on purpose. -may they all be crushed below! pursuit of gain and in the race for it will not take note of their common foe." Last edited by realy; 17-02-2010 at 06:40 PM. Whether you search in Dutch, French, German, English, American, or South-African newspapers of the past 35 years, you will find that there is virtually no information available on a private association naming itself the 1001 Club. Even in the Netherlands, where Prince Bernhard's involvement with Bilderberg should be widely known by now, absolutely no one has heard of his role in creating "the 1001". The only official information available about this club - which the average person is very unlikely to stumble upon - is that it was established in the early seventies by individuals as Prince Bernhard, Prince Philip, Charles de Haes, and Anton Rupert, and that every member paid a one time fee of $10,000 to get lifetime membership - that's about it. This almost total absence of public awareness seems odd, as the men visiting 1001 Club receptions often represent some of the greatest economic interests on the planet. Irish journalist Kevin Dowling, who in 1990 was responsible for a number of important exposés on corruption within the World Wide Fund for Nature and the ineffectiveness of some of the fund’s most important programs, recently stumbled across ISGP and decided to send a 1978 and a 1987 membership of the 1001 Club - the only ones who have ever leaked. Abedi, Agha Hasan~Shiite Muslim. President of United Bank until November 1972. Founder (1972) and president of the Bank of Credit and Commerce International (BCCI), which was initially financed by wealthy individuals like Sheik Zayed bin Sultan al-Nahyan. Ahmed, Sheikh Ali~Corrupt Bengal/Pakistani project developer. According to people from the Amsterdam underworld, Ahmed ended up in an Indian jail in the 1940s, for large-scale smuggling of gold and diamonds. Supposedly, he was bought free for a a huge sum. In the late 40s and early 50s Ahmed is said to have been involved in the arms trafficking from the Netherlands and England to Pakistan, which was formed in 1947. Aitken, Sir Max ~Son of the 1st Lord Beaverbrook (1879-1964) who lived in Canada, and as a staunch imperialist was very opposed to Britain joining the European Economic Community (EEC). The elder William Maxwell "Max" Aitken, the 1st Lord Beaverbrook, became a stockbroker and by 1910 had made a fortune from Canadian cement mills. Went on to become a conservative member of Parliament who visited the Western front during WWI. David Lloyd George granted Aitken the title Lord Beaverbrook in 1918, and appointed him as Minister of Information that same year. During the war Beaverbrook acquired a controlling interest in the Daily Express. Alsdorf, James William~Born in 1913. Son of a Dutch diplomat who moved to Chicago and became an exporter. Quit the University of Pennsylvania's Wharton School of Finance and Commerce as a sophomore in 1933, and took a selling job with his father's A. J. Alsdorf Corp., one of Chicago's oldest export businesses. Bought the Cory Food Services, Inc. in 1942, focusing a lot on the coffee business. Worked for Cory in Chicago, Toronto, London, Oslo, Stockholm, Helsinki, Zurich. Founded the Alsdorf Foundation in 1944. Chairman of Alsdorf International Ltd. in Chicago. Chairman of the Art Institute of Chicago and member of member of the international council of the Rockefeller's Museum of Modern Art (MoMA) in New York City. Involved in many other arts institutes. Member of the Chicago Council on Foreign Relations, the Asia Society, the Newcomen Society, and the Smithsonian Institution. Director World Wildlife Fund. Associated with the leadership of Loyola University, an old Jesuit university in Chicago. Astor, 4th Viscount~Born in 1951. Educated at Eton College, and in 1976 married Annabel, Lady Sheffield, with whom he has two sons and a daughter. Annabel is the stepdaughter of the Viscount's uncle Michael Astor. The Viscount's own stepdaughter, Samantha Sheffield, is a company director and is married to the Conservative Leader David Cameron. Sits as an elected hereditary peer in the House of Lords. Member of the Pilgrims of Great Britain. Bin Laden, Sheikh Salem~He was the older half-brother of Osama Bin Laden and one of only four Saudis in the 1001 Club (late eighties). James Reynolds Bath was his U.S. representative from 1978 and on, through which he made large investments in the United States. In 1979 Bath bought a 5% share in George W. Bush's first oil company, Arbusto. Bath made his fortune by investing money for Sheikh Kalid bin Mahfouz (20% stake in BCCI) and Salem Bin Laden into the BCCI, which was indicted in 1988 for being involved in a huge amount of drug laundering. Salem Bin Laden died in a small plane crash over Houston in 1988. Finally, in 1991, the bank went out of business. This money from the BCCI has likely been used in financing the Mudjahedeen and various terrorist organizations that came into existence after the Afghan war. Please visit here and read more of the extensive list of members of the 1001 Club. The strangest club in the world? - Fugitive banker and drug smuggler Robert Vesco, reportedly working for the CIA; Agha Abedi, founder and head of the BCCI; BCCI shareholder Salem Bin Laden, the older brother of Osama, whose small plane crashed when the BCCI scandal came out; Permindex founder Mortimer Bloomfield, who was a SOE-CIA-FBI Division Five and Haganah/Zionist agent, here talking to David Ben Gurion; and 1001 Club member Mobutu Sese Seko, the anti-communist dictator of Zaire, having a laugh with Prince Bernhard, the 1001's head. Nobility and royalty in the 1001: Prince Hans Adam II of Liechtenstein, who is trying to become the absolute ruler of his country; Gyanendra Dev with Prince Philip, right after Dev's family had been murdered almost entirely by his nephew Crown Prince Dipendra; King Juan Carlos, who doesn't mind shooting endangered species; Prince Johannes von Thurn und Taxis who seems to have been involved in underhand business with leading Cercle members; and Baron Heinrich II "Heini" von Thyssen-Bornemisza, nephew of the notorious Fritz Thyssen. Last edited by mo0n5tar; 18-02-2010 at 04:11 PM. on projects related to the conservation of nature. In 1960, he made a trip through the British colonies that were about to become independent. He made sure that the British government was able to keep their hold on the nature reserves located in the countries of the Commonwealth, even today. Somehow he was able to convince the new African leaders that every person from Africa was a natural born poacher. "Thirty years later, the WWF controls 10% of the world's surface. They control 40% of Tanzania. At the moment they are focused on South-America. This is something of the last 5 years [since 1994-1995]." Some of the largest, and richest, mineral deposits in the world have been found in Africa. 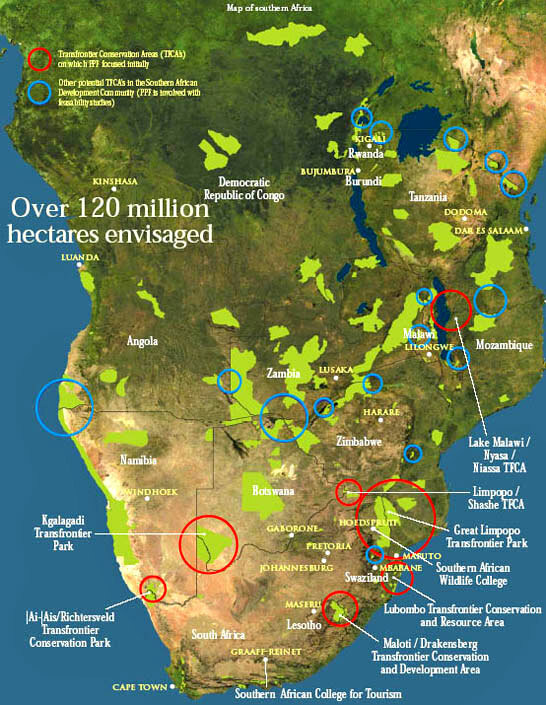 For much of the last half of the 20th century little mineral exploration and development work was done in Africa, except for southern Africa, even though there is significant potential for the discovery of new deposits. By the mid 1990's modern exploration started to spread across much of Africa and many new deposits have been discovered and developed and some of the old major deposits are being renovated. Last edited by mo0n5tar; 18-02-2010 at 04:58 PM. Relevant what with Icke's recent newsletter on the Hippocracy of "Great" Britain. "There are several curious things about these Pilgrims functions. In the first place there is present at these dinners an array of notables such as it would be difficult to bring together under one roof for any other purpose and by any other society... Among the guests were John D. Rockefeller and J.P. Morgan, Thomas W. Lamont and other members of the House of Morgan... We are entitled to know what the Pilgrim Society is, what it stands for, and who these powerful Pilgrims are that can call out the great to hear a British Ambassador expound to Americans the virtues of a united democratic front." - John T. Whiteford asking very reasonable questions in his 1940 pamphlet 'Sir Uncle Sam: Knight of the British Empire'. Adam, Sir Ronald Forbes~ Deputy Director of Military Operations, War Office 1936. Commander Royal Artillery 1st Division 1936 - 1937. Commandant of Staff College Camberley 1937. Deputy Chief Imperial General Staff, War Office 1938 - 1939. General Officer Commanding III Corps, France 1939 - 1940. General Officer Commander in Chief Northern Command 1940 - 1941. Adjutant-General to the Forces, War Office 1941 - 1946. Retired General 1946. Chairman and Director-General of British Council 1946-1954. Member of the executive board of UNESCO 1950-1952, and chairman from 1952 to 1954. President of the United Nations Association. Airlie, 13th Earl of~He subsequently took up merchant banking, joining J. Henry Schroder in 1953. He was appointed a director of the company in 1961 and chairman in 1973. In 1984, Lord Airlie resigned from Schroder in order to take up the position of Lord Chamberlain. He was following in the footsteps of his late father, who served as Lord Chamberlain to Queen Elizabeth the Queen Mother, He remained in the post until 1997. He was made a Knight of the Thistle in 1985. Lord Airlie has also served as the Lord Lieutenant of Angus in Scotland, and as the Captain General of The Royal Company of Archers and Gold Stick for Scotland. His wife, formally known as the Countess of Airlie, is a Lady of the Bedchamber to Queen Elizabeth II. Privy Council. Royal Victorian Order. Aldrich, Malcolm Pratt~Yale Skull & Bones 1922. Special assistant to assistant secretary of Navy for Air, US Navy, 1942-45; discharged with the rank of captain. Alexander, Charles Beatty~director of the International Banking Corporation, Mercantile Trust Company; Equitable Trust Company, Equitable Life Assurance, Society of the U.S., Tri-State Land Company, Windsor Trust, member of the Society of the Cincinnati. Julian Amery~born in 1919 and educated at Eton and Balliol College, Oxford, before starting work as a left wing war correspondent in the Spanish Civil War from 1938 to 1939. Attache on British missions to Belgrade, Ankara, Sofia and Bucharest 1939-1940. Julian was an MI6 operative, although it isn't really known what he has been doing in this function. ...Amery was a close associate of Lt.-Col. Billy McLean, a later Cercle member (and devout christian), since these days. Another rapid transfer sent him to Yugoslavia, to liaise with the partisans fighting Germany. Anderson, Arthur Marvin~Married Alice Mary Sloane in 1909 (seemingly a Pilgrims Society family). Began in banking business in N.Y.C. in 1904. Partner J.P. Morgan & Company 1926-1940. Director of Morgan's U.S. Steel Corporation. Member of the Council on Foreign Relations since the 1940s. Vice president J.P. Morgan & Company 1940-1948. Executive chairman J.P. Morgan & Company 1948-1953. Vice chairman J.P. Morgan & Company 1953-1955, Director executive commity J.P. Morgan & Company 1955-1959. Member of the advisory council of Morgan Guaranty Trust Co. of New York since 1959. Ashdown, Lord Paddy~High Representative for Bosnia and Herzegovina from 27 September 2002 to 30 May 2006. On 14 March 2002 Ashdown testified as a witness for the prosecution at the trial of Slobodan Milošević at the International Criminal Tribunal for the former Yugoslavia. He said that he was on the Kosovo-Albania border near Junik in June, 1998. From this location, through his binoculars, Ashdown claimed to have seen Serbian forces shelling several villages. UN Secretary-General Ban Ki-Moon approached Lord Ashdown for the position of UN Representative to Afghanistan, but this apparently didn't went through because Afghanistan preferred another candidate. Fluent in Mandarin Chinese and other languages. Had a five-month affair with his secretary. Order of St Michael and St George. Order of the British Empire. Privy Council. Member of the Pilgrims Society and a director and co-president of the Royal Institute of International Affairs (Chatham House). Astor, Lord Gavin, Exec. chairman and Pilgrim's president ~Son of John Jacob Astor V (1886-1971), who was educated at Eton College Oxford, used to be a director of Barclays and Hambro, and had bought The Times newspaper in 1922. Astor, John Jacob, 8th~was a British Parliamentary Observer in Johannesburg during the South African General Election. He was a member of the Executive, Association of Conservative Peers from 1996-1998. In 1999 he was elected to the House of Lords. From 1998-2001, he served as an Opposition Spokesman on Social Security and Health from 1998-2003. From 2001, he has been an Opposition Spokesman for Foreign & Commonwealth Affairs, and International Development, and from 2003 to present, Opposition Spokesman for Defence. Deputy Lieutenant of Kent in 1996. Freemason. Astor, Viscount William Waldorf~in 1976 married Annabel, Lady Sheffield, with whom he has two sons and a daughter. Annabel is the stepdaughter of the Viscount's uncle Michael Astor. The Viscount's own stepdaughter, Samantha Sheffield, is a company director and is married to the Conservative Leader David Cameron. He was a Lord-in-Waiting (a House of Lords whip) from 1990 to 1993.
to be controlled in a feudalist fashion by the central banks of the world acting in concert, by secret agreements arrived at in frequent private meetings and conferences." And this was and continues to be the Business of the Anglo-American Pilgrim's society. Official Pilgrims logo. "Hic et Ubique" means "here and everywhere", apparently a reference to the idea that the United States and Great Britain should stand together side by side everywhere. The eagle represents the United States; the lion Great Britain. Within the ranks of the British Pilgrims one comes across a great many Barons, Viscounts, Earls, Marquisses, and Dukes. Members of the British royal family have been patrons of the Pilgrims Society since its inception and regularly attend meetings. Here also well known banking families as Baring, Hambro, Harcourt, Keswick, Rothschild, Kleinwort, Loeb, and Warburg can be found, just as the heads of Barclays and the British managers of U.S. banks as Chase Manhattan and J. P. Morgan. At the moment of this writing the membership list compiled by PEHI contains 1496 names, the vast majority of them from the United States (rough estimate: about 82% or 1227). Analyzing the biographies of these members doesn't just show that the Pilgrims are part of the WASP elite - they are the WASP elite. Kidder, Peabody and Co. Morgan Joseph & Co. Inc.
Blackstone Group US/UK Fourth Nat. Bank of N.Y. Loeb, Rhoades & Co. Rockefeller Center, Inc.
Chase Manhattan US/UK International Banking Corp.
J. P. Morgan Chase U.S. Trust Corp. of N.Y.
Citibank J. G. White & Co. Dodge IBM Phelps-Dodge W.R. Grace & Co. Looking at these tables, it is clear that the major banks of New York and London have been very prominent in the Pilgrims Society, closely followed by a group of influential law firms and insurance companies. A number of corporations have also had a considerable presence in the Pilgrims, comparable to some of the law firms and smaller banks. The most prominent of these might well be IBM, of the Watson family. Read the membership lists, all the big names in the Globalist agenda have been involved with the Pilgrim's at some stage. Last edited by mo0n5tar; 28-02-2010 at 05:32 AM. "Conservative people often fail to see what they are doing when they ignore the evident perils of the Fascist state on the ground that it is after all preferable to Communism... If the Fascist state wins out, the cleavages [between a small group of leaders and all the rest] will be extraordinarily great..."
The collaboration of U.S., British and French companies and banks with the fascist regimes, especially Germany, goes back to the birth of communism in 1917 and the Treaty of Versailles in 1919. The biggest fear of the great industrialists and land barons has always been communism and socialism. If the working classes would manage to stage revolutions as had happened in 1917 in the Soviet Union (which soon turned into a banal dictatorship), they would not only demand higher wages, social security and a reduced work week, but would also attempt to break up the monopolies and redistribute the great land holdings. The ruling class was not about to let this happen and sponsored leaders which would suppress these labor movements. The four biggest fascists of the 20th century working with the Anglo American Elite, while the Anglo American people were being sent to die fighting them. Before and during World War II there was a large group of aristocrats, bankers, and industrialists which sought to cooperate with the new fascist regimes in Europe. Prime minister Chamberlain, the Duke of Windsor clique, Imperial Chemical Industries and the Federation of British Industries, press barons as Lord Rothermere and Lord Beaverbrook, the major banking families dominating the Bank of England--they all supported "Anglo-German peace" while promoting domestic groups as the British Union of Fascists, the Link, the Nordic League and the secretive Right Club. "What England has always desired, and will continue to desire, is to prevent any one Continental Power in Europe from attaining a position of world importance…The consequences of England’s war policy were and are disastrous for Germany. However, we cannot close our eyes to the fact that, as things stand to-day, the necessary interests of England no longer demand the destruction of Germany. On the contrary, British diplomacy must tend more and more, from year to year, towards curbing France’s unbridled lust after hegemony..."
British bankers as Montagu Norman, Lord Kindersley and Charles Hambro (all Pilgrims) called Germany, even after the Nazis had taken over, a "great stabilizing force" , a reference to both French and communist influence. They encouraged large loans to be made to Germany. The same attitude dominated Wall Street. The Morgan bank extended large loans to Germany and Mussolini's Italy. In the mid 1920s Dillon, Read & Company, another major Pilgrims firm, set up Vereinigte Stahlwerke (German Steel Trust) and the German Credit and Investment Corp. with Fritz Thyssen. Thyssen would become one of the most important financiers of Hitler. The Harriman family, Pilgrims and good friends of the Dillons, set up the Union Banking Corporation (UBC) with this same Fritz Thyssen. Other Nazi financiers, the Rockefellers and Schroders, joined forces in 1936, setting up Schroder Rockefeller & Co. The Watsons of IBM (Pilgrims) provided the Nazis with identification and cataloging technology which would make the holocaust so brutally effective. The prominent Pilgrims-dominated law firm Sullivan & Cromwell, headed at the time by the Dulles brothers. "The existence of the Red Book first emerged in 1943 during a heated debate in Parliament. By then, it had already been seized by MI5. For 40 years, the ledger was believed to have been lost and its whereabouts was much speculated upon... What happened to the Red Book? According to Professor Richard Griffiths, the police had it until October 1944. But it seems likely that it was returned to Ramsay after his release. Nothing was seen of it until the late 1980s, when it was discovered at the bottom of an old safe in a solicitor's office. Luckily, the finder was familiar with Professor Griffiths's work and passed it to him. Professor Griffiths used it as a primary source for his book, Patriotism Perverted: Captain Ramsay, The Right Club and British Anti-Semitism 1939-40 [published in 1998], then deposited the book at the Wiener Library. Last week it was, for the first time, opened to the public." As can be indicated from the societies just described, appeasement was not at all unique to the Chamberlain government; it was a policy supported by many people. There was a great difference, however, between the public's idea of appeasement, which was simply focused on the avoidance of a new war, and the idea of the ruling class to use appeasement as a tool to reorganize Europe in a way to their liking. These differences in attitude are quite obvious considering the almost total lack of sympathy for the people having to live under fascist rule. Archibald Roosevelt, one of Theodore, Jr.'s brothers and the father of Edith, was an executive of the Sinclair Oil Company, which is known for having discussed cartel agreements with Mussolini. The son of Theodore, Jr., Theodore III, worked for the Du Pont company from 1936 to 1941, which was another notorious cartel negotiator, in this case with German industrialists, the Japanese Zaibatsu and the pro-fascist Imperial Chemical Industries in Great Britain. as the aristocrat Sir Frederic M. Bennett; chair Institute for the Study of Terrorism, a clone of Crozier's anti-communist Institute for the Study of Conflict; member Committee for a Free Britain, which spent more than Pounds 200,000 on press advertisements attacking Labour during the 1987 election; member Committee for a Free World, an American neo-conservative group; member Media Monitoring Unit, which attempted to "expose" left-wing bias in television news and current affairs programmes... deputy chairman of the Independent Broadcasting Authority.."
I recommend reading it all for yourself to get a good idea of the Globalization agenda, and inform yourself as to the scope and history of this movement. Excerpts of a 1991 officers list of the Pilgrims of Great Britain. Lord Chalfont is listed. The conclusions made by the author are very enlightening indeed. * The Pilgrims Society predates the founding of the Council on Foreign Relations and the Royal Institute of International Affairs - two closely-linked think tanks - with almost 20 years, and therefore easily connects J. P. Morgan, Sr. (d. 1913), Andrew Carnegie (d. 1919), and Jacob Schiff (d. 1920) to the same Anglo-American network. Daniel Coit Gilman (d. 1908), who incorporated Skull & Bones into the Russell Trust and founded the Carnegie Institution of Washington with Andrew Carnegie in 1902, is another interesting example. * This discussion of the Pilgrims Society confirms statements that have been heard since at least the early part of the 20th century that the international bankers in New York have been "in league" with the British aristocracy. The connections between members of the Council on Foreign Relations and the Royal Institute of International Affairs have been there, just as the connections between some of the leading New York families and the British royal family, but the Pilgrims makes the whole picture much easier to see. In other words, it will convince more people in a shorter amount of time that there has been such a thing as an Anglo-American aristocracy. * An analysis of the Pilgrims Society makes it possible to better describe the elitist Anglo-American social network, consisting of the Episcopal and Presbyterian Churches, Templar and Masonic organizations, and a whole range of recreational groups. The Council on Foreign Relations and the Royal Institute of International Affairs (which is changing its elitist image) have only drawn in persons that are influential in foreign policy or benefit in some other way from attending meetings. The majority of U.S. Pilgrims have not been members of the CFR, but their biographies still tell an interesting story. Among the important Pilgrims who have not been CFR members are Hulbert S. Aldrich, the Drexels, Cornelius Vanderbilt III, William Vanderbilt Cecil, William S. Farish III, Walter Cronkite, Donald Elliman (Time), and Thomas A. Murphy (General Electric). * Even today there are no historical membership lists of the Royal Institute of International Affairs in the public domain. This Pilgrims Society article has circumvented this problem and still makes it possible to identify and link together many historical members of the British establishment. What might be good to know is that the Anglo-American Establishment is not all powerful. Within the United States they have had some rivalry from the military and intelligence establishments, just as industrialists and businessmen from other parts of the country. Other opposing forces have been the Vatican-Paneuropa network in Europe and Zionism, especially the radical revisionist branch. Unfortunately, the leading figures in all these opposing groups appear to be more reactionary than those of the liberal Anglo-American Establishment. This doesn't mean that the globalists of the Anglo-American Establishment are necessarily decent, upstanding citizens; it just means that they speak more articulately and plan things better. Just remember how Morgan banker Thomas Lamont tried to educate a reactionary fascist murderer named Benito Mussolini on how to appeal to the Anglo-American public. Last edited by mo0n5tar; 28-02-2010 at 05:35 AM. Ostensibly a dinner club, the Pilgrims Society consists of two chapters. The London chapter of the Pilgrims Society was established on July 11, 1902, followed by the New York chapter on January 13, 1903. Its purpose is to foster better Anglo-American relationships through cooperation of top banking and manufacturing institutions. The London society is responsible for a hosting a dinner welcoming the new US Ambassador to the United Kingdom, and the New York chapter hosts a reciprocal event. Curiously, most of these ambassadors have already been members for some time. "...the existence of this Wall Street Anglo-American axis is quite obvious once it is pointed out. It is reflected by the fact that such Wall Street luminaries such as John W. Davis, Lewis W. Douglas, John Hay Whitney [...] were appointed to be American ambassadors in London." most powerful man in the country, and he came from Harvard. Ms.
towards a New World---a New World Order. It seems that the Pilgrims Society represents that old dream of Cecil Rhodes to create a worldwide English-speaking free-trade zone (his exact words), with the dominant position for the Anglo-Saxon race. Honest exposés or extreme-right propaganda? Last edited by mo0n5tar; 04-03-2010 at 02:48 PM. Thanks, bookmarking this thread for now. Are there any Non-Zionist in the NWO? How do you do with de gummischuh? The first element of Nazi occult beliefs was in the mythic land of Hyperborea-Thule. Just as Plato had cited the Egyptian legend of the sunken island of Atlantis, Herodotus mentioned the Egyptian legend of the continent of Hyperborea in the far north. When ice destroyed this ancient land, its people migrated south. Writing in 1679, the Swedish author Olaf Rudbeck identified the Atlanteans with the Hyperboreans and located the latter at the North Pole. According to several accounts, Hyperborea split into the islands of Thule and Ultima Thule, which some people identified with Iceland and Greenland. The second ingredient was the idea of a hollow earth. At the end of the seventeenth century, the British astronomer Sir Edmund Halley first suggested that the earth was hollow, consisting of four concentric spheres. The hollow earth theory fired many people’s imaginations, especially with the publication in 1864 of French novelist Jules Verne’s Voyage to the Center of the Earth. Soon, the concept of vril appeared. In 1871, British novelist Edward Bulwer-Lytton, in The Coming Race, described a superior race, the Vril-ya, who lived beneath the earth and planned to conquer the world with vril, a psychokinetic energy. The French author Louis Jacolliot furthered the myth in Les Fils de Dieu (The Sons of God) (1873) and Les Traditions indo-européeenes (The Indo-European Traditions) (1876). In these books, he linked vril with the subterranean people of Thule. The Thuleans will harness the power of vril to become supermen and rule the world. The Germans were highly interested in establishing friendly relations with Tibet. Their agenda, however, was slightly different from that of the Tibetans. One of the members of the Schäfer expedition was the anthropologist Bruno Beger, who was responsible for racial research. Having worked with H. F. K. Günther on Die nordische Rasse bei den Indogermanen Asiens (The Northern Race among the Indo-Germans of Asia), Beger subscribed to Günther’s theory of a “northern race” in Central Asia and Tibet. In 1937, he had proposed a research project for Eastern Tibet and, with the Schäfer expedition, planned to investigate scientifically the racial characteristics of the Tibetan people. While in Tibet and Sikkim on the way, Beger measured the skulls of three hundred Tibetans and Sikkimese and examined some of their other physical features and bodily marks. He concluded that the Tibetans occupied an intermediary position between the Mongol and European races, with the European racial element showing itself most pronouncedly among the aristocracy. The European Coal and Steel Community in March 1951--- a single market amongst six countries in Europe, including Germany and France. Parliament, a legal system based on continental law and headed by a European Court of Justice, a Central Bank and a tax system called VAT. There was also a Common Agricultural Policy (CAP), although Fishing was not yet included. There was no way of changing any parts of the treaty unless all signatories agreed to do so. The European Court of Justice was set up to give judgements which must always be in favour of closer political union. This court had little to do with “Justice” and much to do with “Integration”. It should have, more accurately, been called the European Court of Integration. This treaty, and all the others following, were drafted in accordance with the “ Acquis Communautaire” system, “that which is acquired by the Community.” It means power, once handed to Brussels, is never returned, and cannot be re-negotiated. are now living under a new legal order. Parliament surrendered its sovereignty in 1972. The doctrine of the primacy of European Law holds good. European Union laws have overriding force with priority over our law.” This judgement was confirmed on appeal. Unbeknown to the British electorate, Edward Heath, in order to gain membership of the EEC, had made a deal in 1972 with the EEC and gave away British sovereignty of our territorial fishing waters. Up to that point Fishing had not been included in any Treaties, but was later added in the Maastricht Treaty under Articles 38-47. Harold Wilson, after campaigning in the 1974 General Election on the basis of wanting to renegotiate our terms of EEC entry, gave us a referendum. The referendum was on whether or not we were happy with the “renegotiated terms” to approve Britain’s 1973 entry into the EEC under the Treaty of Rome. In fact there were no changes at all to the terms of entry, and the treaty itself was unchanged. He strongly advised the country to vote YES, giving so called “trade” reasons, and directly reassuring us that there would be no loss of sovereignty. This we did, on a low vote of only 47%. There has never been another referendum in the last 35 years. Now, nobody below the age of 53 has ever had the chance to vote in a referendum on how this country should be governed. to the European Community, with the word “Economic” left out. It also removed the national veto in certain areas by the principle of Qualified Majority Voting in the Council of Ministers. It also introduced European control over lawmaking, employment, regional development, environment and foreign policy. money, without a murmur, so as not to alert the public about what a disaster we faced. any further, thus ending the treason procedure against Douglas Hurd and Francis Maude. and influence. London, Scotland, Wales and Northern Ireland are 4 of the 12 regions, with the rest of England broken up into 8 separate EU Regions. You will have noticed how services such as health, ambulances, planning guidance and now police are being regionalised along these lines. European Commission have an immediate effect in law in all countries, without being debated in any national parliament. An example is Regulation 3760/92 which decreed that from 1st January 2003 EU fishing boats would be able to fish right up to our shores, thus abolishing our 12 mile limit. more power goes to Brussels. The Treaty also introduced the notion of a Common Defence Policy and a single currency. We all know about the currency, but have you noticed the BBC talking about the European Navy patrolling the seas off Somalia, when the ship doing so is clearly a Royal Navy frigate acting under orders from its HQ in Brussels? Are we prepared to fight for a European state? In the early 1990s Britain entered the Exchange Rate Mechanism (ERM) in preparation for joining the Euro single currency. However we entered at the wrong rate, and in attempting to maintain a fixed rate for the pound we suffered, in the following two years, high interest rates reaching 15%, unemployment rising from 1.5m to 3m, and 100,000 businesses going bankrupt. To avoid total monetary collapse and the loss of all our reserves to the speculators, Britain was forced to leave the ERM and float the pound. The pound has been floating happily ever since. However the European Commission intends that Britain should be in the European currency, because there cannot be full political union without monetary union. The Treaty of Amsterdam of 1999: “Just an amending treaty,” Tony Blair. charged or to be put on trial by a magistrate or judge. 308 UK citizens were extradited in this way in 2008, according to the charity Fair Trials International. Article 191 grants the EU power to withdraw or prevent funding, private, state or at EU level, for political parties deemed “unsuitable”. This means that the EU can suspend or ban a political party if it so decides. This could first apply to EU-critical parties and is associated with the laws of a police state. state. In other words, the EU’s foreign office will not be at the service of the nation states, but will supplant them. This is now being enacted through the EU’s Brok Report and with its new Foreign Minister, Baroness Ashton. The European Commission would take full executive powers for itself, would choose its own members who could not be removed. Furthermore the Commission, if it so decided, would be able to change or “amend” any existing arrangements in the same way as Hitler did with his Enabling Act in 1933. In other words, the Commission was effectively given the powers of a legally appointed Dictatorship. The European Council, representing the heads of all the member states, and acting as a form of Trustee for the EU, would become merely a Senate, or talking shop, with no remaining powers. After the demise of the Constitutional Treaty of 2004 the European politicians gradually recovered from the shock of the French and Dutch reversals and set up the Lisbon Treaty which, they said, was not a Constitutional treaty at all. It was instead, merely a “tidying up exercise”, to help the European Commission be more “efficient” in governing the enlarged Europe of 27 nations. The Eastern Lib Dem MEP and avowed federalist, Andrew Duff, co-wrote this Treaty/Constitution. enable the previous treaties to be reformed or adjusted, and more importantly, to make it look less like its predecessor of 2004. The actual wording of the European Reform Treaty is very difficult to understand because it keeps referring to previous treaties, and the reader has no way of really grasping what it means without the help of an experienced constitutional lawyer. Few ordinary Members of Parliament could master what it really meant. However the experts who did understand what it was about, included Valery Giscard d’Estaing, the ex French President and author of the “dead” Constitution of 2004, who said it was virtually the same. Indeed out of 250 articles only 10 were different from its predecessor. The key self amending clause was retained in the Treaty under Article 48. This is extremely dangerous as it allows EU Ministers to amend the treaty behind closed doors with no further need for parliamentary approval or referenda. The main differences were the lack of the word “Constitution” in the name, which was replaced by the word “Reform,” the removal of the 12 star national flag and the EU “Ode to Joy” anthem from the text. The two latter items have already been added back to all EU procedures currently taking place. Treaty and this took place in 2008. Again, much to the consternation of the politicians the Irish voted NO in their referendum. However, in the summer of 2009 Brussels again presented to Ireland the same referendum on the unchanged Treaty with the “invitation” to vote again. The Irish voted YES this time round, and once Poland and the Czech Republic reluctantly followed Ireland, without a referendum, the Treaty was finally ratified by the politicians (but not by the peoples) of all EU countries and became law on December 1st 2009. Meanwhile Britain was denied the right to vote on the Lisbon Treaty, affecting the entire future of this country, by Gordon Brown, the leader of our Labour Government who denied that the Treaty was the same as the Constitution Treaty. He was aided by the leader of the Liberal Democrats, and both of them instructed their parties to vote directly against what each party had promised in their 2005 Manifestos, namely, to have a Referendum on any Constitutional changes affecting Britain. Treaty, which have been described earlier, and will be the last treaty required. There will not be any need for further treaties because the European Commission has now acquired all the powers it needs. The Commission has become a legally created Dictatorship although the way it was done leaves very serious doubts about the whole concept of a truly united Europe. This study is an attempt at a preliminary transnational investigation of the Paneuropean Right and particularly of the covert forum, the Cercle Pinay and its complex of groups. Amongst Cercle intelligence contacts are former operatives from the American CIA DIA and INR, Britain's MI5, MI6 and IRD, France's SDECE, Germany's BND, BfV and MAD, Holland’s BVD, Belgium's Sûreté de l’Etat, SDRA and PIO, apartheid South Africa's BOSS, and the Swiss and Saudi intelligence services. Politically, the Cercle complex has interlocked with the whole panoply of international right-wing groups: the Paneuropean Union, the European Movement, CEDI, the Bilderberg Group, WACL, Opus Dei, the Moonies, Western Goals and the Heritage Foundation. Amongst the prominent politicians associated with the Cercle Pinay were Antoine Pinay, Konrad Adenauer, Archduke Otto von Habsburg, Franz Josef Strauss, Giulio Andreotti, Paul Vanden Boeynants, John Vorster, General Antonio de Spinola, Manuel Fraga Iribarne, Margaret Thatcher and Ronald Reagan. Despite a wealth of covert operations centring on media campaigns to promote or denigrate election candidates, the international impact of the Cercle complex has not yet  been the main focus for an investigation in any language. The information contained in this study was compiled from a sheaf of internal documents from the Cercle Pinay and its partners, the Belgian AESP, the British ISC and the Swiss ISP, as well as over one hundred books and numerous Press reports in English, French, German and Spanish (all translations by this author). The insight afforded is only partial; as Brian Crozier wrote in his memoirs about this author's previous research on the Cercle complex: "There are pitfalls in writing about confidential matters from the outside, and drawing on similarly handicapped material" (1). However, the publication in 1993 of Crozier's memoirs, Free Agent - The Unseen War 1941-1991, served to confirm the main thrust of this investigation and filled in some but by no means all of the loopholes; in turn, this investigation has uncovered some of what Crozier preferred to conceal. Once the fragmented information is pieced together, the network that emerges cannot be overlooked: the Cercle complex can be seen to be an international coalition of rightwing intelligence veterans, propaganda assets and top politicians who would shape the 1970s and 1980s. To take the British example, much of the destabilization of British democracy in the 1970s can only be fully understood by analysing the international support given to groups like the Anglo-American “deniable propaganda” outlet, the Institute for the Study of Conflict. The Cercle Pinay was a major source of support for the ISC virtually from its inception on; the Cercle Pinay and the ISC also tied in with another key British group, the Foreign Affairs Research Institute, heavily funded by BOSS, apartheid South Africa's secret service. BOSS's other incursions into domestic politics in Britain, notably their smear operations against leading Liberals such as Jeremy Thorpe and Peter Hain, were a significant factor in the hijacking of British democracy in the 1970s. Three Cercle members on the FARI Board assisted FARI's actions from 1976 through to the early 1980s. FARI in many ways was the British successor to a previous Cercle operation to support South Africa; the Cercle and the ISC had been active partners in setting up a Paris-based propaganda outlet in 1974 as part of South Africa's covert media campaign later exposed in the "Muldergate" scandal. German intelligence reports on the Cercle Pinay written in late 1979 and early 1980 which were published in Der Spiegel in 1982 also shed new light on a "Thatcher faction" within MI6 in the lead-up to the Conservatives' 1979 election victory. Whilst receiving wide publicity in France and Germany, these reports have never been covered by the British Press. This serious omission is astounding in the light of the undeniable authenticity of the reports and the startling allegations they contain: one of the German intelligence reports dated November 1979 quotes a planning paper by Crozier about a Cercle complex operation "to affect a change of government in the United Kingdom (accomplished)". The report goes on to describe a working meeting held at Chequers, the Prime Minister’s country residence, just after the Conservatives' election victory which brought together Prime Minister Thatcher, serving MI6 Chief Sir Arthur Franks, and two Cercle complex members - Brian Crozier and former MI6 Division Head Nicholas Elliott. Crozier's planning paper quoted by the German report also specifically mentioned international Cercle campaigns "aiming to discredit hostile personalities and/or events". This is no isolated example; throughout the 1970s the Cercle Pinay complex was active in similar ways in France, Germany, Spain, Portugal, Italy and Belgium. In the latter three countries, the Cercle complex also had close links to those waging a strategy of tension to support a right-wing coup, the latest example of which was the strategy of tension which killed 32 people in Belgium from 1982 to 1985. The Cercle complex’s other covert campaigns to promote right-wing candidates concentrated in two key periods: the mid-1970s and 1979-80, both central to the electoral defeat of the Left throughout Europe generally. The Cercle Pinay itself is an informal but confidential strategic talkingshop consisting of a core of "regulars" who invite occasional guests to Cercle meetings and who are assisted by a range of associates in many nationally-based groups. In order to make the complexities of the Right in several European countries understandable to readers, I have focused on the personnel links within and between the national groups forming part of the Cercle Pinay complex. As one of the tendencies of such groups is for their members to "play musical chairs", changing place frequently on the raft of names sponsoring an organization, a personnel-based research approach can give rise to the danger of over-estimating the ties that link some characters or organisations. Sharing a Board membership with someone does not necessarily imply intimate knowledge of the other's various activities. The fragmentary nature of the information available does not allow us to draw definite conclusions about to what extent a particular group or person was aware of Cercle operations, particularly of those run by several of the Cercle "regulars" with intelligence experience who would later form a private covert intelligence service, the 6I, within the Cercle complex. Crozier himself makes the point that many of the prominent politicians invited to sit in on Cercle strategic sessions had no knowledge of their hosts’ more clandestine operational activities – if only because of the "need to know" principle. Nonetheless, a stalwart multi-functionary on the Boards of several groups linked to the Cercle can be presumed to have some deeper involvement beyond just lending his name to the cause. This study can only be a beginning; a closer look at some of those involved at national level could shed more light on the significance of the Cercle complex. The only point of certainty beyond the information given here is that the Cercle merits further investigation. Finally, this book is dedicated to the small community of unpaid parapolitics researchers who have done much to uncover the truth that lies behind the history of the 20th century. Two in particular deserve thanks for the help and encouragement they have given me in compiling the information given here: Robin Ramsay of the Lobsterand Jeffrey M. Bale of the University of Berkeley, California. Many journalists have already covered fragments of the Cercle Pinay complex: Péan, theSpiegel, Roth and Ender, Ramsay and Dorril of the Lobster, Dumont, Mungo, the Arbeitskreis Nicaragua who produced IGfM, the Young European Federalists, Herman and O'Sullivan, Gijsels, and Brewaeys and Deliège were all important sources.